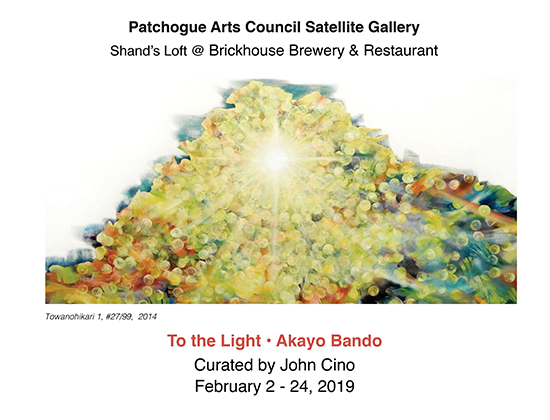 Exhibit: "To The Light" by Ayako Bando | Patchogue Arts Council, Inc.
Ayako Bando was born in Tokushima, Japan where she recalls being “surrounded by the beauty of nature with its mountains, rivers, trees and flowers”. Since 2014 she has worked on the “Towanohikari” series which translates as “Eternal Light”, a light that illuminates our hearts and brings purity. Inspired by her youth and the works of Wassily Kandinsky, she sees the light emanating from the spirit intertwining “people and nature with the same common forces of life, where we are all connected … born pure and innocent into this world”. Ayako Bando has studied art in Osaka, Tokyo, London and New York. She has earned numerous awards in Japan and has exhibited in Japan, the US, Germany and Italy. An artist’s reception will be held February 9, from 6 to 7:30pm.